It's that time of year again! Time for my annual Fall Mini Sessions. They will be held Saturday, November 2nd this year. I will be doing sessions throughout the day and most likely at two different locations. Email me if you are interested and if you have a preference on time of day. I already have several families interested, so spots will go fast. If there is enough interest, I will schedule another Saturday as well. A mini session is $100 for 10-12 photos in color and BW. Each session lasts 30-45 minutes. 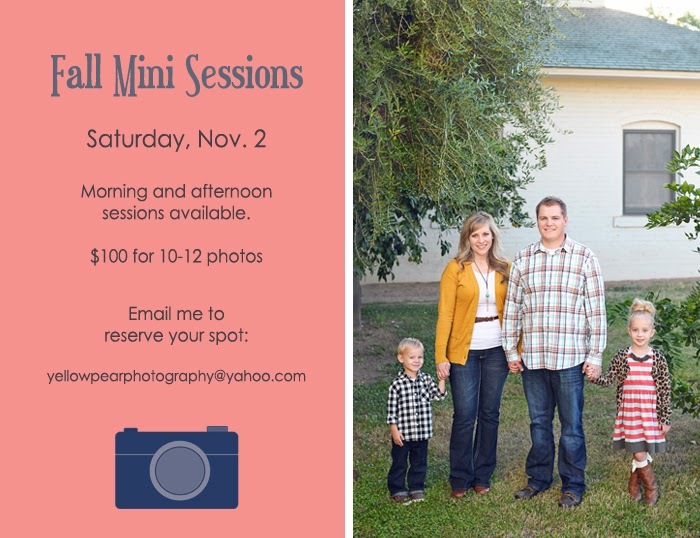 I love Mini Sessions! It's a whole day jam-packed with cute families and a lot of laughing and smiling. So fun.